Subscribe to the Frisco Podcast on iTunes! This episode of the Frisco Podcast is brought to you by Stan’s Main Street. Scott Ellis: All right, welcome back, Jeff Cheney, to The Frisco Podcast. It is good to have you with us today. Jeff Cheney: Thanks, Scott. As always, it’s good to be here. Scott Ellis: Yeah. I know you are super busy right now. There’s only a couple weeks left before the election coming up and you have to be just scrambling like crazy. Jeff Cheney: Absolutely. I mean, there’s events, [inaudible 00:00:22] after event, [inaudible 00:00:23] after event, which is great because I’ve been able to speak to literally thousands of Frisco residents, and I’m really excited about it. I’m excited about the level of engagement that I’m seeing here in the city. We’ll continue that fast pace all the way through May 6th. We’ll speak to as many people as we can. Scott Ellis: That’s right. We will remind everybody of this when we come back to the end, but the general election is coming up. It is early voting starting on, I believe, April 24th. Scott Ellis: That runs through May 2nd. No voting on the Sunday in between, which is April 30th. Then the election itself is on Saturday, May 6th. Jeff Cheney: That’s right, right around the corner. Scott Ellis: Right around the corner. Get out and vote. I’m a good fan of saying that all politics is local and that the votes you cast in your local arena effect your day to day life more than they do in the bigger elections that people tend to get a little bit more caught up in, so get out and vote. Jeff Cheney: Yeah, there’s no question about that. For sure. Scott Ellis: So let’s dive into that a little bit. You have been on the city council for nine years, or you … I’m sorry, you were on the city council for nine years. Scott Ellis: You’ve done a lot of service for Frisco. You’ve been a part of a lot of the growth and a lot of the big decisions that have brought us to where we are. Moving forward, what would you say are some of the challenges Frisco is going to face? Jeff Cheney: Well, even of my tenure of the last nine years, a lot has changed in Frisco. I was first elected, as you said, in 2007 and served through 2016, where I termed out. In Frisco, you’re allowed to do three terms of three years each. That’s why Mayor Maso has termed out as well in this election cycle. A lot has happened here in Frisco. Really, going forward, the biggest challenges are going to be deciding what kind of city Frisco wants to be. I think it’s becoming evident in this election that this … there is a clear distinction between the two different paths of the mayoral candidates that they would like to go. We recently redid our comprehensive plan, and in that plan, we discovered that essentially, if we were going to build to maximum density, our end population number would be between 350 to 370,000 people. For me, I have absolutely no interest in building to 350,000 people. I’m not sure that that’s a city that I’d want to live in or raise my family in. For me, the distinct difference is I want to keep Frisco to be the same place that … People are moving here to day to be why they’re moving here 10 years from now as well. That is really because we’ve got quality schools, we’ve got world class amenities, we’ve got great parks and a really high quality of life. Really, right now, we’re about 60% developed, but the remaining 40% is largely our commercial corridor. Ultimately, the decisions made over the next 5 to 10 years are going to truly dictate what this city becomes because as that corridor and how dense it builds out is really going to drive everything else in this city. For me, I want to see a focus more on quality developments and less quantity of development, if that makes sense. Scott Ellis: Yeah, that makes total sense. Jeff Cheney: I’d love to see a much lower population number, closer to our original target of 275, 280,000 people. Plano is the exact same land mass as Frisco, it’s 70-square miles. They’re at sitting at about 275,000 and they have one more urban spine than we do, by having Interstate 35 run through their city as well. For me, going to a population of 350,000 would really change the city. I joke that I coach my boys’ basketball team, and we have one field house here in Frisco. Even at 162,000 people right now, it’s so crowded that we’re assigned 9 p.m. practice times. Jeff Cheney: That starts impacting the quality of life and quite frankly, imagine if we doubled and tripled what that would do. It’s not just a field house, it’s all of our amenities. It’s our parks, it’s our theaters, it’s the schools, all those things. For me, the commitment is definitely to maintain that same quality of life that our residents have come to expect. Scott Ellis: Well, that’s good to hear. At least from my standpoint. I certainly don’t want to speak on behalf of all people in Frisco, but I know, from the conversations we’ve had with citizens but also with other city council members, there is a lot of concern over that, that big number. That is a challenge that we’re going to face because it’s certainly … If you’ve had to get on the toll road at all lately, it doesn’t even seem like it matters what time of day it is, it’s just crowded. Jeff Cheney: It seems like the traffic got bad over night. Jeff Cheney: I think it was a Tuesday that it happened. Jeff Cheney: I will say that this … The council over the last nine years or so has been fairly well unified on many of the issues, that’s why we’ve been able to accomplish as much as we’ve been able to accomplish. When you row in the same direction … I will say that this is the one issue where there was the most contrast of opinion, as far as what the end population we wanted it to be. There was some that wanted to go 350, 400, maybe even more. Then the vast majority targeted no, we want the lower number. We want a quality community and not just over build our community. That’s the vision that the majority of your remaining council has, and quite frankly, that’s one of the reasons why the council members that are currently serving or will be serving in the future have endorsed my campaign, it’s that shared vision of where Frisco is going. Scott Ellis: Certainly, and as with any decision, there are usually trade offs. I think the lower number speaks to a higher quality of life in Frisco, but are there any downsides to that? Does that in any way substantially affect our tax base or things like that in the future? Jeff Cheney: No. I mean, I’m in a unique position being a CPA, to kind of understand how development and tax base work together. I would actually argue the opposite. For me, the vision I have for our commercial developments is a cross between what you see in Legacy West, Shops of Legacy, and Waters Creek. Shops of Legacy, what they did very well was they were able to incorporate that business use and that encourages day traffic to their restaurants and the retailers and helps them thrive. What they did poorly, in my opinion, is there’s just a lack of open space. There’s very little walkability. The sidewalks are narrow. It’s just too dense of a development. You flip over and look at Waters Creek, they did the opposite well. What they did well is they really tried to create a true experience in their development. There’s open space, they have that little courtyard are for summer festivals. There’s great patios, beautiful amenities in there, it’s highly walkable. They just did an extraordinary job with that end of it, but they didn’t incorporate any business use. That makes the retailers and the restaurateurs struggle for that day traffic. The type of development I see here in Frisco is really a blend of those two, where we’ve got a 10-mile corridor of the toll way, so we do not need to over build that. What we would like is high quality developments to come through there. To have the office component in a more spread out area with open space and connectivity and truly, that is the type of development that is going to attract these Fortune 100 type employers and the entrepreneurs that we’re looking for. More and more businesses are making real-estate decisions on their moves. For instance, Legacy West, they’ve been doing a great job of relocating employers to their development. They’ve been doing a phenomenal job. In my opinion, the reason is that they provided the right type of development. The workforce is completely changing right now. [inaudible 00:08:53] Toyota and a Chase, they’ll move thousands of employees across the country to relocate just because they know in 10 years to compete [inaudible 00:09:03] the workforce, they’re going to need to provide that type of environment. In 10 years, 70% of our workforce is going to be millennial generation and how they want to work and truly how the employee of today wants to work is not to drive in through the gates and go to that office compound of yesteryear. I mean, those types of office complexes will die. What businesses now know is that employees want experiences. They don’t want to go to a team meeting in a conference room anymore. They want to be able to walk outside and go to a coffee shop or go to a bark bench that’s around the corner. They want to be able to walk at lunch and walk to lunch and those types of things. The employers are getting that, and to compete for a workforce in 10 years, you’re going to have to be in that kind of environment. We’re ripe to build those with us having a blank slate and a prime location, but we have to build them the right way or we’re not going to get the right type of employers. To me, we actually increase the tax base by building more quality and it’s not about quantity. Jeff Cheney: Well, and you can really see that happening because even if you go to other communities in the metroplex and you see the developments that were built more the concrete jungle mentality as far as as many office towers as you can stack together. Those are the ones that are not thriving right now. Hall Park, right now, I mean, it’s no coincidence that they dropped the name office from their development. I mean, the reason they did that is because they’ve always been visionaries over there and they know they’re about to put up their last building. They could go down the road to the next deal. They know to compete in the future, they’ve got to come back in and add these kind of amenities because they’re visionaries and can see that and so they’re redeveloping their property right now to add new components. That’s truly the development of the future. Me and my background, understanding that, I think is uniquely positioned to make sure our toll way corridor develops the way that our citizens want it to develop. Scott Ellis: Very good. Speaking more of background, let’s talk about some of the accomplishments, or some of the things that you’ve been a part of while on city council for those nine years. Surely, you’ve been a part of a lot of big decisions, a lot of things that have come Frisco. What are some of the things that you’re most proud of that you’ve been a part of? Jeff Cheney: … it’s hard to close a house in 60 days. Scott Ellis: It really is. Jeff Cheney: That type of deal, Frisco is uniquely set up to be able to be nimble and we have some structures in place where we can do that type of deal. It’s a council that’s not paralyzed by the difficult decision. I mean, that was one we went out and got and closed it and it’s completely changed the shape of that area. Now, I will say, when we got our first site plan on that development, I was not happy about it. It wasn’t what I thought had been promised to the city of Frisco for the investment that we had. They had made it clear that they wanted input from council and wanted us to be partners and then develop what the community wanted, so they sent it out to us and asked for feedback. I certainly gave mine. I actually took a week off of work, I drove around DFW, I took pictures, hundreds of pictures, and comments and marked up their site plan and sent it back. I think my comments and pictures ended up being something like 40 pages long. We had a big meeting and … to go through them all and everyone was a little bit nervous because I’m kind of aggressive on these types of developments and want to see the best. Sure enough, first thing they said was they love all the comments. We went through them one by one and ticked them off and I believe every single comment that I wanted, all the way down to I wanted roof deck patios overlooking the plaza, which if you’ve been there lately, you see those under construction right now and will be some really extraordinary dining experiences when those open up later this fall. There’s one that they wouldn’t do, and I was pretty adamant about it, which was the practice field behind their headquarters since the public was paying for those, I wanted that to be open space, open to the public when they weren’t in use. Jeff Cheney: … [crosstalk 00:14:54] open space. I mean, it’s become something very unique. The retail isn’t even open yet, and you can go down there any time of day and you can see people using that field. Scott Ellis: That is fantastic, and it’s interesting to hear the history of how that came about as well, so thank you for taking the time to do that because that’s really going to be quite a nice facility when it’s all said and done and all the retail’s open. We’re looking forward to that. Jeff Cheney: Oh, absolutely. Other projects that we’re definitely proud of, we managed a budget through some difficult times. We went through a recession period, one of the worst recessions we’ve seen and during that period, when I first got on council, 50% of our budget went to debt service. That’s something that had always alarmed me. After 10 years of work, we were able to get that down to 35%, which is a much more sustainable number. I chaired the budget and audit committee for eight years, I spent a lot of work diving into the details of the audit. On top of that, we were able to reduce our tax rate during that period and actually build up a capital reserve fund. This is the first time the city of Frisco had a capital reserve fund. That was something that was a big passion of mine, and a big passion of the mayor’s. It took a commitment to wanting to get that started, which we were able to do just a few years ago and built that up to $10 million. Sure enough, when that bury the lines movement came along, that’s how we were able to front load that payment that needed for that to happen. Without having to sell debt, we were [inaudible 00:16:28] tapping that capital reserve fund, and that’s going to be refunded through [inaudible 00:16:31] fees over the next few years, that will be replenished. That’s the exact reason we wanted to start something like that. The work with our budget has been something I’m proud of. Still more work to do. People are concerned about their residential values exploding, rightfully so. I think it’s now time for Frisco to phase in a homestead exemption, it hadn’t made sense in years past, but now with the explosive growth of our residential values, I think it’s important for us to get one of those in. Scott Ellis: For those that aren’t maybe familiar with that, and I know there’s a lot of people moving in from out of state, can you just give a real short overview of what that homestead exemption means to them? Jeff Cheney: Yeah, so basically, the home that you claim as your homestead, meaning your primary residence, there is typically a value that reduces your taxable value right at the top. The city of Plano has one, Frisco [inaudible 00:17:26] has one, I believe theirs is 25,000. It’s an immediate relief to your property taxes. The city of Frisco has never had one. The concern that I see is that the price of homes is becoming a challenge for many budgets, even though Frisco’s certainly an affluent community, but across all price points. People don’t expect for their tax values to rise 10% a year for multiple years in a row. It’s becoming a challenge for our young families to be able to afford homes in Frisco. It’s being a challenge for our seniors on fixed incomes to be able to afford homes in Frisco. That’s one tool to help solve all those problems, where if you … Say you had a $50,000 homestead exemption, if you bought a $300,000 house, you’d only be taxed on it as if it were worth 250,000. It provides an immediate tax relief. Scott Ellis: Got it. Good deal. Thank you very much. Relative to … Not so much the communities around us, but just in general with where Frisco has been in the past and where you think we’re going. One of the issues I know that’s top of mind for you is overall financial health of the city, so how would you describe the state of that now? To be fair, for everybody listening, you’re not currently on city council, but just from your experience in the past and the insights that you do have. How would you describe the financial health of Frisco? Jeff Cheney: Well, since I was the chair of that committee for eight years, I think it’s really strong, but there’s specific parameters why I think that. First and foremost, we have city staff that are superb in their fields. [Nel Lang 00:19:07], our budget manager and all her staff are extraordinary. Of course, the leadership of George [inaudible 00:19:15]. It’s always been a goal to provide high level of city service at the most affordable tax rate possible. That budget has been strong. We have multiple tax bases. Our sales tax is a very strong component to our budget. We have a lot of tourism here in Frisco, so that’s what all these facilities have brought to the table, is bringing that tourist dollar. Those are ways that we’re able to get people who don’t necessarily live here in Frisco to contribute to our tax base. Of course, we have high commercial value and high residential values as well, just because of the cost of homes here, so that adds to the budget. What we’ve seen is our conservative policies have put us in a very strong position. Our fund balance, our minimum goal is to have 25% cash reserves. We’re well over 30%. We do have that capital reserve fund set up. It looks like this year, just me seeing the budget, it looks like things are actually out performing what was budgeted as far as sales tax revenues and so forth, so it looks like we’re actually going to be ahead at the end of this year, which is always a good thing. I do expect that to be an opportunity where a lot of these conservative fiscal policies we’ve put in place over the years are going to enable us to either reduce the tax rate or, what I would prefer, is to pursue the homestead exemption. Scott Ellis: Okay, very good. Let’s move on to a couple of more niche topics, things that are frequently batted around in Frisco. The first one that comes to mind is the arts. What is your vision or your thoughts on the future of the arts in Frisco? Jeff Cheney: Well, one thing that I always say is that we have to learn from elections. Of course, the arts of Collin county, years ago, that was a very heated election with a lot of hurt feelings. Essentially, I believe it was like 51% to 49% where the city voted to take that project off the table, essentially. What that told me was there was a strong support for an art center, just not strong support for an art center that’s government funded and in the city of Allen. To me, the parameters that I would like to see is I would like to see a performing art center here in Frisco, I think our demographics demand it. Our community is aging, we were used … we used to be in the median age of 34, now we’re 37. RoughRider stadium, the city was a partner in that but the RoughRiders run it and operate it. That’s the same with all of our other facilities that we have here. That would be a better run facility. I would love it to be in another development and not by itself, like the arts of Collin county was proposed. I want it to be a draw to an area. For instance, if it were in like a Hall Park or a Wade Park, or one of these other developments where now it becomes an anchor and a destination and creates other experiences around it where you can go to dinner and then walk to the show and then maybe you want to go to the … have a drink afterwards. Those types of experiences. I’d really love it attached to an office park, so I mean, Hall Park, I think, is a great opportunity for something like this where now you’ve created a secondary use where the businesses during the day, if they have a conference or there’s some reason to have a facility like this, it’s available to them. Now you’ve created another revenue stream, you make a facility just that much more successful. Those are the parameters that I would love to see, and what I would think would take to be a successful development. Obviously, Hall Park already has a commitment to the arts. [inaudible 00:23:38] a supporter of that. There have been discussions of potential … the potential for a facility there and that is very much a project that I would be supportive of to fill that need for our residents. Scott Ellis: Okay, very good. Some good thoughts in there and some things I haven’t heard in the past, so I’m … be happy to share that with all of our fellow Frisconians. Jeff Cheney: Yeah, [inaudible 00:24:01]. Scott Ellis: Let’s just … Couple more questions and then I’ll let you get back to all the various things you’ve got going on right now. First of all, you’ve spoken a number of times and used the term a community of excellence. Tell me what that means to you. When people hear you say that, what does a community of excellence, and with respect to Frisco, look like to you? 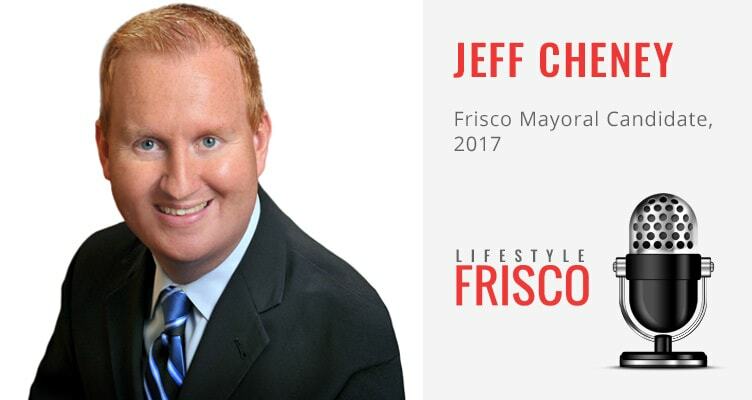 Jeff Cheney: Yeah, Frisco has the brand, in my opinion, of some of the more extraordinary cities in the area. The analogy that I use is I remember the first time I was taking my boys to play in a tournament … baseball tournament in Southlake, and the whole week, I was excited just thinking of the brand of Southlake, thinking gosh, these fields are going to be really, really nice and it’s just going to be a great experience. Sure enough, they were some of the nicest fields in the entire metroplex, extraordinary experiences, everything that you would expect that Southlake brand to be. Frisco has that same brand. When people come here, they have that level of expectation where we have the vision of you do things once and you do it right. For us, in my mindset has always been that, whether we’re developing a park or we’re working on a commercial development, or we’re going back and revitalizing downtown or all these types of decisions that are made on a daily basis. That always has to be the premise or the expectation of the Frisco brand, but more importantly, that’s what our citizens have come to expect. I kind of coined that term when we were doing a visioning session trying to come up with a motto and that’s … I’ve stuck with it as far as everything that I’ve put out, that that’s my ultimate goal, is for Frisco to be thought of as a community of excellence in everything that we do. Scott Ellis: All right. One last question and then were going to tell people where they can learn a little bit more. I’m just going to come straight at you with this one. Scott Ellis: Why should people vote for Jeff Cheney? Jeff Cheney: Frisco, right now, is at a crossroads. We’ve had a lot of success over the years due to great leadership, and the city should always thank the past leaders that have lead, but right now, the future of Frisco and how it’s [inaudible 00:26:18] out over the next 10 years is ultimately going to decide what this city becomes. In my opinion, the skillsets most necessary in this era of Frisco is understanding budgets and understanding development. Those are things that are certainly my strengths, that I bring to the table. More importantly, it’s about the vision that our residents want for the city of Frisco because there are two distinct paths that are before them in this election. I believe just talking to people that the vision that our residents want is they don’t want the 350,000 people version of Frisco. They want the much less dense version of Frisco, they want the world class amenities to come in, they want the destination dining and the office that we’re lacking right now to come fill those holes in our city and create new experiences, but not to the point of where it overruns our roads and leads to a traffic problem and our facilities become overused and degrades the quality of life here. The last thing I’ll leave with the voter is that a vote for Jeff Cheney for mayor is knowing that you have somebody in office that’s going to work with the council, that has a shared vision with the council, that’s supported by the council, but are working together to make sure we’re maintaining the high quality of life here in Frisco, and truly leading Frisco to be that city of excellence like we mentioned. Scott Ellis: Very good, and that’s a great place for us to leave off. If people want to learn more about you, where can they go? Jeff Cheney: Our website is choosecheney.com. Of course, there’s hashtag choose Cheney on all social media and Facebook and Twitter and the like. They can reach out to me on my cell phone any time. I’ve sent it out to 80,000 households already. It’s 214-707-7320. Scott Ellis: You are a brave man. I bet your phone is going to be blowing up now. People are going to want to hear you. There’s a couple of opportunities for them to do that. Candidate forums that are coming up next week. Can you tell us a little bit more about those? Jeff Cheney: Yes. On Monday evening, the chamber of commerce is hosting a candidate forum for all city candidates. That’s in the Grace church, Grace Avenue Church in Frisco square. I believe it starts at 6:30. Wednesday night of next week is the school board candidate forum at the same place and time. Then Wednesday at lunch, Frisco Young Professionals is having their candidate forum at that same location. Then Thursday at the college, Thursday evening starting at 7 o’clock, the Frisco community action board is having their mayoral only debate at the Collin College. Scott Ellis: All right, so no excuse. You’ve got a whole bunch of opportunities to get out and hear from Jeff in person. We hope for those of you that may not be able to make it out, this has been informative and interesting. No matter where you’re leaning or what direction you’re headed, please get out and vote. The election is on May 6th, early election … early voting, rather, will be about a week or week and a half before that. Please get out and cast your vote. Jeff, thank you so much for taking the time today. I really appreciate it, and as always, it’s good to catch up. Jeff Cheney: All right. Thank you as always. Scott Ellis: All right, have a good day. Jeff Cheney: All right, bye.